Your search for an impressive dessert is over. These Mascarpone Tarts with Fresh Berries are a stunning end to any meal. In my house, these mini Mascarpone Tarts with Fresh Berries are simply known as “The Tart”. Hands down, they are the most requested dessert in my house. My kids have them on their birthdays, and it is my go-to dessert when entertaining. And really, what’s not to love about them? 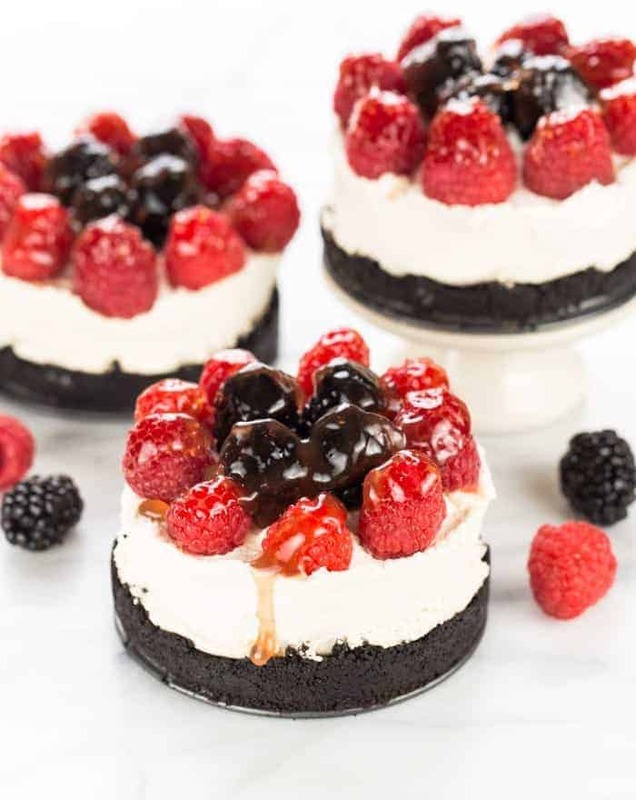 Mini Oreo crusts with a creamy mascarpone cheese filling and topped with fresh raspberries and blackberries. Sweet, but not too sweet, and they include fresh fruit, so they have to be sort of healthy, right? 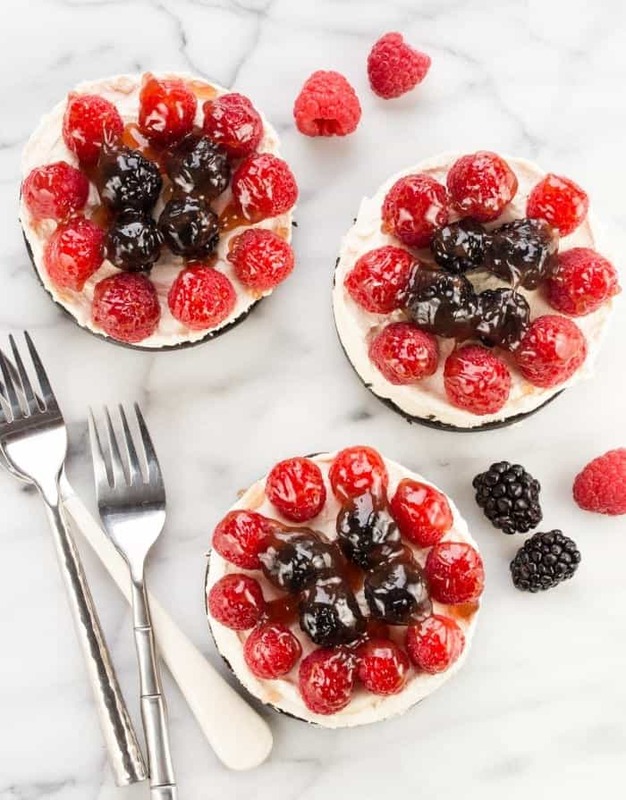 Best of all, these mini Mascarpone Tarts with Fresh Berries look like you spent hours slaving away in the kitchen. But no worries, your secret is safe with me. This would be a perfect dessert for a family valentine’s dinner. It is full of pink and purple and everyone gets their own tart, so no arguing over who gets the biggest piece. Keeping the peace is always a bonus. Tip: Don’t have mini tart pans? Don’t worry, this recipe works great in a 9 inch tart pan or springform pan, too! A creamy mascarpone cheese tart topped with fresh berries. Mix cookie crumbs and butter together. Divide mixture equally among six mini cheesecake pans and press into bottom of pan. Bake in preheated oven for 5 minutes and remove. Cool completely. Mix the mascarpone cheese, whipping cream, powdered sugar and vanilla together until stiff peaks form. Divide filling equally among the cooled chocolate crusts. Clean berries and dry them on a paper towel. When they are dry, place the berries in concentric circles on top of filling. Melt jam in a small pan and brush over the top of the berries. Chill for at least 3 hours to set. Looking for more baking recipes? Follow us on Pinterest! Follow Garnish with Lemon’s board Best Holiday Baking Recipes on Pinterest. I’m not usually one to have a sweet tooth but I have to say these look awesome! I would love to try these out! Thanks for sharing! Absolutely! Love those peanut butter chocolate chip cookies! They disappeared quickly at my house! Fruit always makes dessert seem a little healthier, doesn’t it? This may just be my dream dessert…and it doesn’t look too difficult to make! I am going to make this as soon as I can. Thanks for sharing! It is relatively easy to make! Enjoy and let me know what you think! The mascarpone is such a fun addition! Thanks, Heather! Lisa, I love this combination. I’ve made homemade mascarpone (which is really simple) and I”ll bet it would be fabulous in this dessert. A winner! Oooh, homemade mascarpone sounds amazing! I can’t wait to check it out! Best tart I’ve ever had! Thanks, Christie! It’s one of our favorites too! For the cookie crust do you use a sandwich cookie like Oreos or just a plain chocolate cookie (something like Oreos without the filling)? Hi CoreyAnn, You can use either kind, I usually use Oreos 🙂 What a lucky mama you have! Happy Birthday to her!